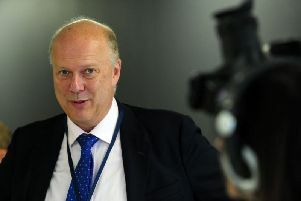 TRANSPORT SECRETARY Patrick McLoughlin has warned Network Rail bosses there is no guarantee they will get a bonus next year amid continued criticism over the company’s performance. Mr McLoughlin announced last month that none of the company’s executive directors would get a bonus for the past year as he disclosed that a series of major rail improvement programmes were being “paused” amid delays and cost overruns. They include electrification of the transpennine and Midland Main Line routes in Yorkshire. Giving evidence to the Commons Transport Committee this evening, he indicated that he was sympathetic to MPs’ concerns that bonuses should be withheld in future years given the deep problems with Network Rail. The “reset” of Network Rail’s £38 billion five-year plan has seen electrification work on the Midland mainline and the Transpennine route between Leeds and Manchester put on hold to the fury of commuters. The announcement came after overruns to engineering work over the Christmas period led to chaos on the network, with tens of thousands of travellers caught up in the confusion. Mr McLoughlin nevertheless defended the £675,000-a-year salary paid to Network Rail chief executive Mark Carne, saying it was important that the firm was able to attract the right calibre of people. “If we didn’t recruit the best people into those jobs and we didn’t get the delivery of the services then the committee would also be complaining to me,” he said. “The next argument would be that we are not prepared to pay the right kind of salaries to attract the best people. It is running a very major, safety conscious organisation which is responsible for moving four million people a day. SNP MP Stewart McDonald said the public would struggle to understand why Mr Carne was being paid almost five times as much as the Prime Minister. “I agree you need the best people, I agree you need to pay them properly. I do just question whether ‘properly’ comes to £675,000, given all the problems,” he said. Mr McLoughlin was forced to defend himself in the Commons on July 16, the day The Yorkshire Post launched its Back on Track campaign calling for the reinstatement of the proposed electrification schemes.